Breckenridge resident Pat Gephart makes a descent on a splitboard snowboard from the summit of the 20,310-foot Denali, North America's highest point, on June 27, 2018. 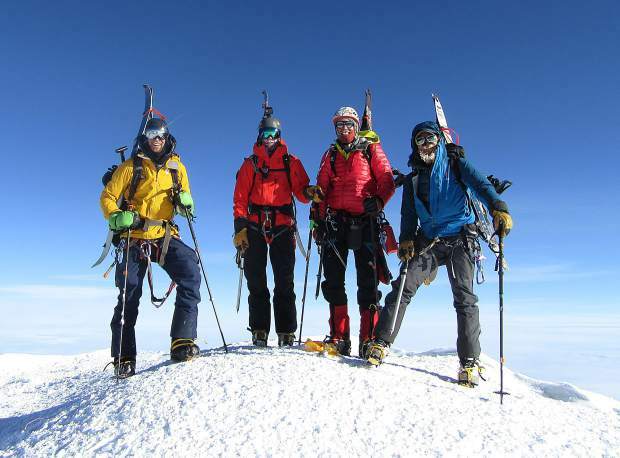 From left to right, Mike Meru, Pat Gephart, Pat "Perry" Johnson, and Reid Kalmus stand at the 20,310-foot summit of North America's highest point, Denali, while in the Alaska Range on June 27, 2018. Breckenridge resident Pat Gephart, who summited Denali with his Weston splitboard in June 2018, stands on Mount Victoria in the TenMile Range with the Gore Range in view in the background on Thursday, Jan. 3, in Frisco. Summit County locals Reid Kalmus and Pat "Perry" Johnson ascend the ridge toward 17,000 feet on the way to Denali's 20,310-foot summit. 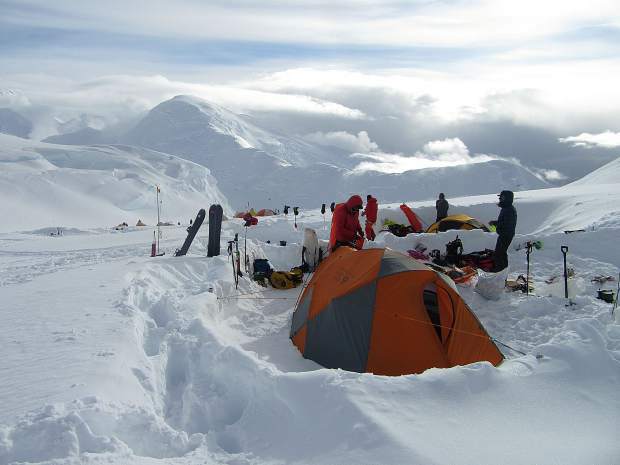 This camp at 11,000 feet in the Alaska Range is one of the major checkpoints when attempting, via the West Buttress route, to summit Denali, North America's highest pont at 20,310 feet. Breckenridge resident Pat Gephart took this photo from the 14,000-foot camp that is 6,000 vertical feet below the summit of Denali, North America's highest point. Summit County locals Reid Kalmus and Pat "Perry" Johnson ascend toward Denali's summit with a serac of the Kahiltna Glacier in view in the background. Breckenridge resident Pat Gephart took this photo of members of his group ascending toward the summit of Denali. 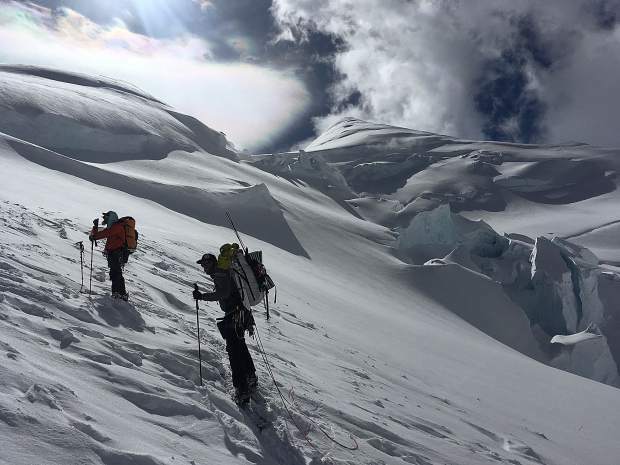 Summit County locals Reid Kalmus and Pat "Perry" Johnson ascend toward Denali's summit with gear in tow. Thinking back to his month-long expedition to the summit of Alaska’s Denali last summer, Pat Gephart estimates there were at least 200 people on the megamountain along with him and his Summit County group. Of all of those expeditioners he came across, Gephart could count on one hand the amount of people who snowboarded from the 20,310-foot summit formerly known as Mount McKinley. The 32-year-old Breckenridge resident and Pennsylvania native was one of them. On June 27 of last year he achieved his goal. Gephart strapped into his Weston Range 161 splitboard, riding approximately 200 yards along the narrow ridgeline down from Denali’s cloud-splitting summit. To Gephart, this was his latest adventure within a passion he describes as “alpinisim on a snowboard.” Along with his fellow Breckenridge backcountry mates Reid Calmus and Pat “Perry” Johnson, Gephart set out on June 8, 2018, to ascend approximately 14,000 vertical feet — all above tree line. Once there, despite the serene, windless conditions amid Alaska’s endlessly lit summer days, Gephart wasn’t self-congratulatory. Rather, he was hyper-focused on safely riding the crampon-trampled summit snow. Gephart had to make the executive decision to unstrap from his board when the Denali ridgeline was particularly precarious — 2-3 feet across allowing for one ski line and no real room to turn. The other risk in snowboarding the hard snow along the ridge was the reality that if he lost balance and fell one way, it’d potentially be into a crevasse — a deep open crack in Denali’s glaciated terrain. Lose balance and fall to the other side, and Gephart said a snowboarder like him would never be found again. These are the inherent risks with snowboarding lines down megamountains. Despite the danger, it’s expeditions like these that excite some of Summit County’s most experienced and adventurous backcountry recreationists like Teague Holmes, Adam Karchster, Chase Frantz and Dave Bottomley, who were also chasing adventure in Alaska. 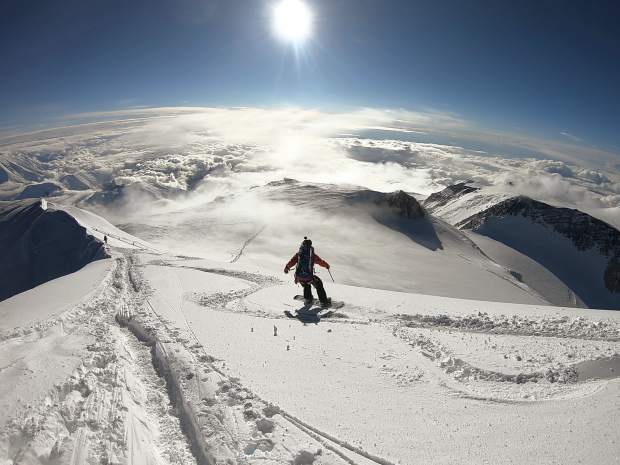 LISTEN: Pat Gephart of Breckenridge takes us through the minute details of his Summit County group’s expedition to summit North America’s highest point, Denali, and the amazing backcountry snowboarding that accompanied the trip. For Gephart, a year after he rode the Fuhrer Finger line on Mount Rainier and the South Side line on Mount Hood, something on Denali was the logical next step. 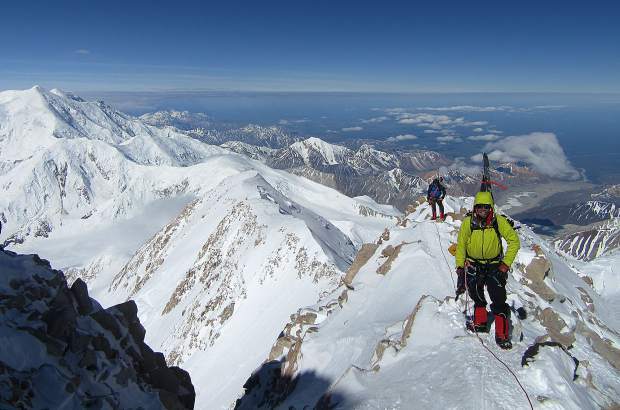 He planned for Denali’s West Buttress route, the mountain’s most commonly climbed route. 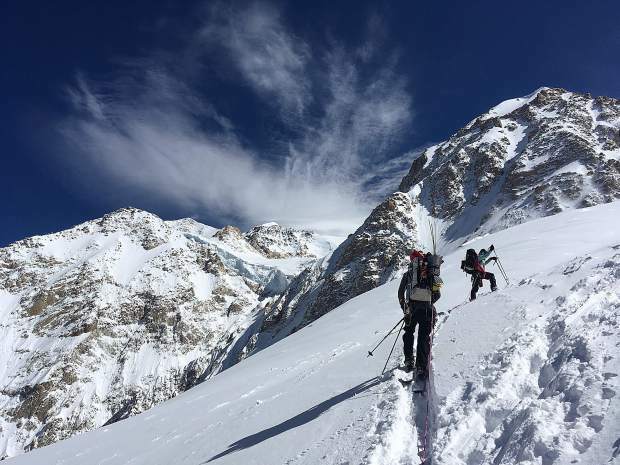 Leading up to the expedition, Gephart felt he and his trio were ready for Denali thanks to their well-rounded experience with winter mountaineering in Summit County. Also an avid ice and rock climber, Gephart believed his experiences surviving and thriving in the cold and snowy backcountry of Colorado’s High Country would be ideal preparation for whatever Denali threw at him — namely any steep, icy vertical faces. Gephart also realized Alaska mountaineering is much different than anywhere else. It’s very committing. You have to have the right gear, the right cooking systems. Also, the proper implementable crevasse and glacier training is a must. Snowboarding off of Denali is a world away from where Gephart’s snowboarding life began, back on small resort halfpipes in Pennsylvania. Just four years before his Denali trip, Gephart became hooked on splitboarding. Splitboards are a relatively new technology that allows snowboarders to literally split their board down the middle. This allows riders to do the same kind of uphill backcountry traversing that skiers do. Just like touring, splitboarders slip one-way carpet-like traction sleeves over the equivalent of skis, facilitating upward mobility while preventing downward sliding. As such, the Weston snowboard Gephart rode on Denali was very different from the resort snowboards he grew up learning on. 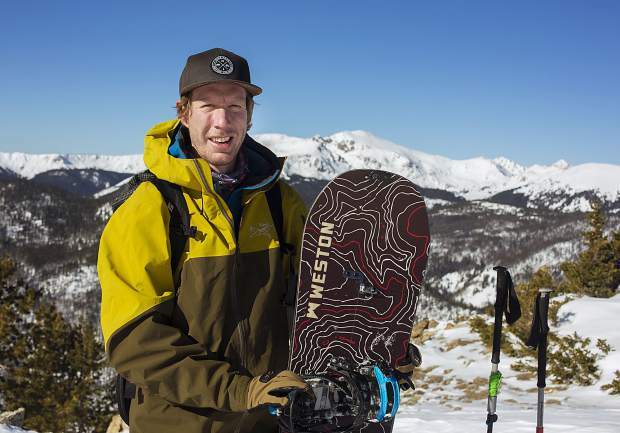 But it’s only on a splitboard where Gephart can progress into the more technical mountaineering he’d like to do in the future, whether that be back at Denali or even in the Himalayas. While ascending from one camp to another on Denali, Gephart may have already been thinking ahead to other expeditions. He was also dialed in to basking in the strategy and fun of the Denali trip. The fun parts included riding the maritime snowpack powder down from Denali’s 14,000-foot camp. While riding this natural, above-tree-line terrain, Gephart took in the powerful, raw beauty of the jagged peaks surrounding Denali, such as Mount Hunter and the summertime cerac ice and rock falls in the distance. The location of that camp was, effectively, the line of demarcation between more tame terrain below and the steep, 50-degree incline that led to Denali’s summit. But before they could even reach the camp, Gephart and his crew experienced the worst of Mother Nature’s wrath at their 11,000-foot camp. That’s where they bunkered down for six days, sitting and shoveling out a heavy storm. Gephart described it as a great introduction into Alaskan mountaineering, as the group needed to prepare their campsite with dug-out, snow-cube walls to protect from the howling winds. 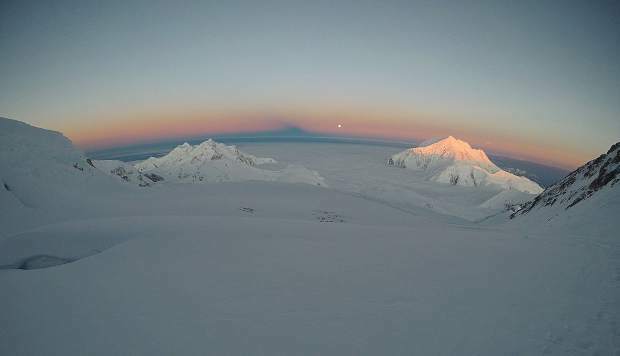 As for the big day, when they reached the summit on June 27, the crew waited for a window in the weather that allowed for relatively warm, minus-15 degree low-wind conditions at the summit. From 14,000 feet and up, Gephart opted for crampons over skins, as the terrain was too steep. With his splitboard on his back, he and the group roped together and slowly ascended the final segment of the mountain. 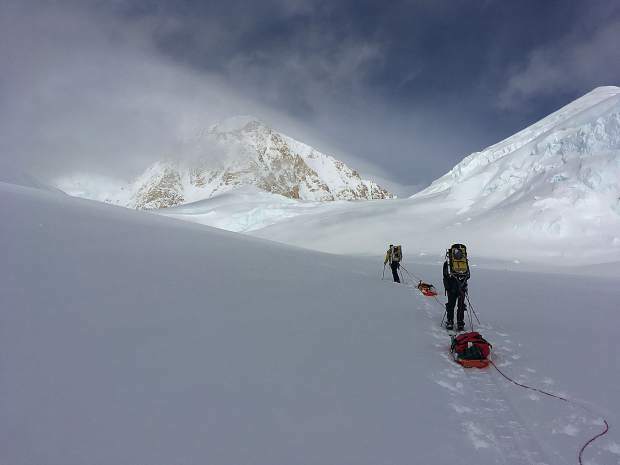 About 24 hours after they set out from the 14,000-foot camp, descending from the summit, Gephart trudged through some of the more sketchy sections of Denali. His group had fought through a case of frostbite, one individual with fluid in their lungs and an overall relative lack of energy. Still, the several elements of alpinism on odysseys like these are what Gephart lives for.